Design. Cost. Control. Live estimating for construction firms. To know the cost of your build as you design it is to have real control. After all, what is a design on its own? A what-if. A vision without a price tag. You know the dimensions of the rooms, you know where you’re putting the windows, the doors, the plumbing, the electrics – but your material choices are what really matter. All of that from the few lines you’ve drawn on your screen. Imagine. You might be happy with the selection, or you might want to swap in another material based on its price or the thermal performance. Or you might decide to wait until the design is complete, and then go back in to tweak either the dimensions or the materials. And the same applies to the foundations, the external walls, the roof, the stairs, the flooring and so on and so on. Welcome to BuildingWorks and two of its modules, Design and Estimate. Together this totally integrated software system provides seamless connectivity. 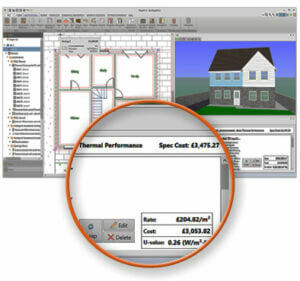 No one else in the UK is offering the opportunity to draw your construction project using simple CAD tools whilst watching a 3D model and estimate build live on screen – simultaneously showing you the cost of the materials, the labour involved, the rates, energy performance and much more. AND culminating in a full Bill of Quantities (New Rules of Measurement) and detailed costings. 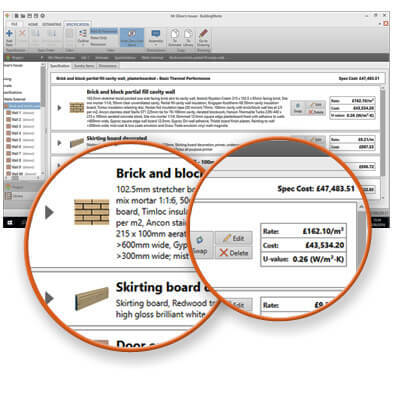 It may sound all very BIM-like and if that’s what you want – that’s what it is. To us it’s joined up thinking. Moreover, BuildingWorks employs all the practical aspects of BIM but essentially it’s a coordinated, effective, holistic process for getting a project completed on time and on budget. And that’s a way of working that any building firm would welcome. Design. Cost. Control. With BuildingWorks the power is with you. 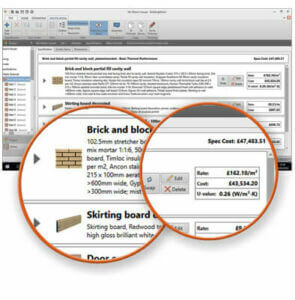 BuildingWorks is a unique desktop subscription package with outstanding support. For further information call 0117 916 7880 and speak to one of the team or email hello@getbuildingworks.com or try it now.